An awesome thriller. In terms of style alone, O’Neill’s book is in a class of its own. This is many books in one: a metaphysical exercise about the nature of dreams and the power of the mind; a Gothic horror story; and a brilliant description of the threadbare nature of middle class Victorian Scotland. [A] spellbinding tale of a soul divided. O’Neill is a masterful storyteller and has created characters embodying questions about good and evil, faith and fanaticism. But readers won’t pause too long to admire his erudition – the thrilling story will have them turning pages compulsively. A disturbing novel that proves both timeless and timely, at once a chilling page-turner and a thought-provoking inquiry into the true nature of evil and the dangers of suppressing the imagination. O’Neill has a rare talent for at once frightening and enlightening readers. The Lamplighter comes to serve as a testament to the power of the imagination. Not least of which, his own. Altogether brilliant. O'Neill's novel is no mere whodunit. Lyrically written, it is a nuanced exploration of the power of imagination, and of the birth of evil out of the violation of innocence. In spots genuinely terrifying, it is throughout deeply, though quite unconventionally, religious. As terrifying as a child’s nightmares – and as wonderful as waking from them. A superior example of the craft. O’Neill’s verve never slackens. His narrative panache carries us nonchalantly over tests of our credulity. It is hard to think of another recent Australian novelist whose career has begun so flamboyantly and yet with such assurance. Fractured and multi-layered. Gloriously unabashed about character. [The] research is witty and dynamic. O’Neill is a grand storyteller, adept at evoking evil and playing with ambivalence. O’Neill has come up with an intelligent, fluid, faultlessly-written and totally convincing novel. Maybe the devil really does have all the best tunes. [A] superb historical thriller. As the plot develops, the story expands to include not just the chilling serial-killer tale with fine characters and great atmospherics, but a more intellectual dimension. Throughout, O'Neill displays a great ear for dialogue, a fine sense of humour and an eye for the extra little details. When you read this one, make sure you are not alone and that the lights are on. A wonderfully sinister story of evil intent and possession in Victorian Edinburgh. Brings history to life with acute bravura. Ingeniously audacious and imaginative. Rich and entertaining. Good enough company for two readings. Part mystery, part fantasy, but weighing in with the literary resonance of something more profound. A meticulous piece of narrative imagination. Accomplished, fluent and clever. O’Neill’s book is a dazzling effort that manages to incorporate a number of disparate ideas into a thrilling, disturbing and gut-wrenching whole. [He] skilfully weaves a tale that gains momentum with each successive page, yet also involves much thought and questioning. With The Lamplighter, he demonstrates a level of skill that far outclasses many veteran thriller fictionists. This is a writing voice not to be missed. 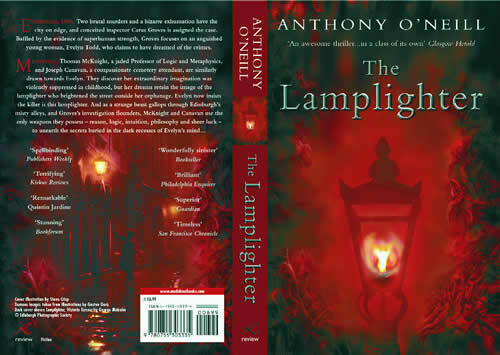 The Lamplighter is, on many levels, an absolutely extraordinary performance. It is the sort of completely realized novel around which a career is made. 2016 © Anthony O'Neill, All rights reserved.